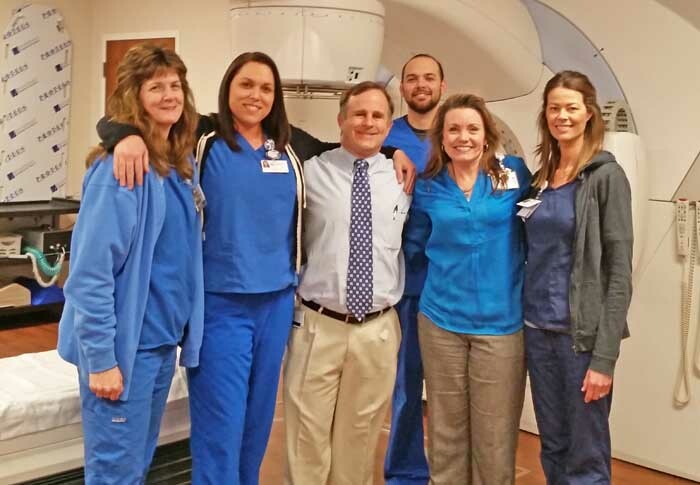 Kevin Roof, MD of Southeast Radiation Oncology and his team at Novant Health Huntersville all wore blue on March 5, 2016 for Novant Health’s “Wear Blue Day” to raise awareness about Colorectal Cancer. The American Cancer Society has deemed March as Colorectal Awareness Month. Colorectal cancer is the second leading cause of cancer deaths among cancers that affect both men and women. Studies have shown that early detection of polyps can help prevent the development of colon cancer. The American Cancer Society recommends screening for colon cancer for average risk patients beginning at age 50 for both men and women. There are multiple tests for screening for colon cancer, and you should discuss with your doctor which test is right for you. People at increased risk for colon cancer include those with a personal history of colorectal cancer or adenomatous polyps, personal history of ulcerative colitis or Crohn’s disease, or strong family history of colorectal cancers or polyps. These patients may need more intensive screening and may need to begin screening at a younger age. Congratulations to Dr. Roof, and the team at Novant Health Huntersville Radiation Oncology, for their support of colorectal cancer awareness. All of the SERO physicians and staff strongly encourage all patients 50 or older to discuss screening for colorectal cancer with their physician.